In 1929 Scott Mouse, Sr., purchased the Cross House. It is a good thing that he did. When the house was built in 1894 the neighborhood was highly desirable; indeed, it was the neighborhood. By about 1910 however, its proximity to downtown — originally an asset — had caused the neighborhood to begin a steep decline. This process was vastly accelerated by a newfangled invention called an automobile. Because the Cross House is on the corner of Union Street and Highway 50, its lot became far more valuable for a commercial business rather than a grand old house. Across America, this exact situation played out in countless cities, and while a very few grand houses managed to hang on, most were ruthlessly demolished to make way for gas stations, parking lots, restaurants, office towers, etc. But Mr. Mouse had a plan. He turned the house into an apartment building. And this, no doubt, saved it. 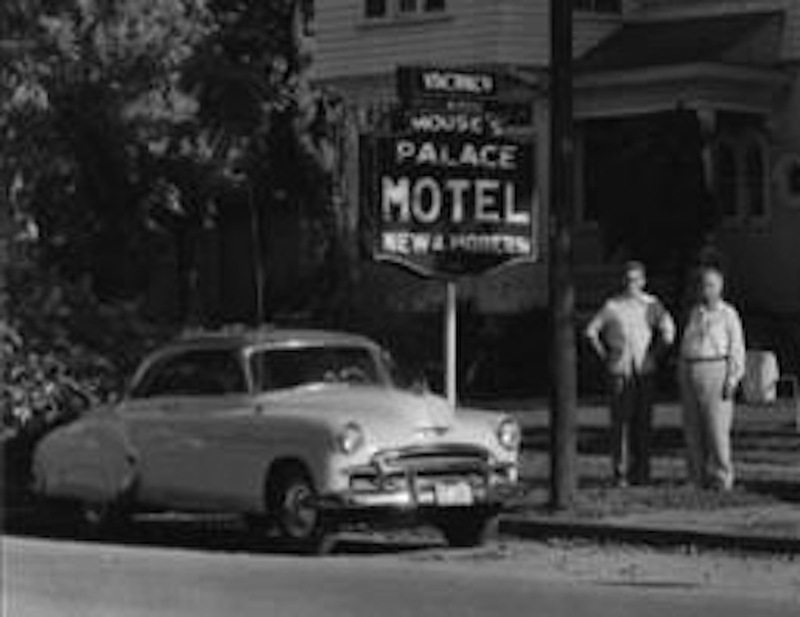 In 1950, his son, Scott Mouse, Jr., then transformed the house into the Palace Motel. And this, no doubt, saved it again. The Mouse family sold the Cross House in 1960. But their thirty-one-years of ownership protected and adapted the house to fit its changing environment. Today, the house has come full circle, and since 1999 is again a private home. It is incredible, astonishing, and miraculous that, considering all that the Cross House has been through, it is so intact today. Battered, yes, but intact. 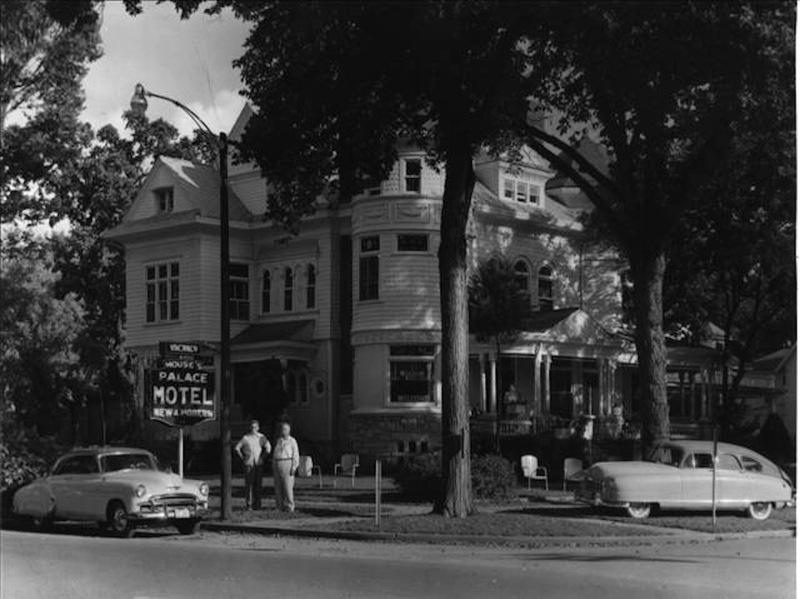 The Cross House, early 1950s, as the Palace Motel. I love this image. A close-up of the neon sign. It reads: Mouse’s PALACE MOTEL New & Modern. I would kill for this sign. It’s funny how desirability got flipped on its head in my area. There are brownstones on Broad Street, which is I think 100 feet wide building to building. Then the other streets based on William Penn’s original grid (extended outward in every direction) have medium sized houses, and the narrow streets bisecting the blocks have tiny ones like mine. But I think being on an insular street where you can go about 10 miles per hour max is perfect. We had a real double whammy around the same time; the Broad Street Subway made a wreck of the robber barons’ front yards at exactly the same time that the Pennsylvania and Reading Railroads electrified their commuter lines. Also interesting, the old money part of central Philadelphia stayed desirable with only a brief dip in the 60’s and 70’s, while the new money areas never recovered. At least the brownstones survive, even if many of them are walkups with aluminum and glass entry doors. Digging your blog Ross! It’s awesome you’re “scrapbooking” the journey. It’s forever in the cloud now. Imagine the importance it could be or will be for someone to see and read about the work done to save this grande dame a hundred years from now. I can tell you are proud. I’m surprised I’ve only discovered it as I to follow Old House Dreams regularly; it’s only after the comments on the McCray manse that I found out you had a blog, too, and am glad I did as this is fantastic. Must of started following Kelly’s after yours was posted maybe. I’m leaving a comment because the picture of the motel struck me, it’s interesting because of the era of the cars, the sign and of course the home and was just thinking that it would be cool hanging somewhere in the house. Bonne chancé Ross. P.S. Say a thank you to the guys that help you. Love what you’re doing to my grandfather and father’s home. You are amazing! Can’t wait to come and see the finished product. And remember…give me a job!